This is the open-air termination of a solid dielectric cable featuring ethylene propylene rubber insulation (the salmon colored section). Initially, this cable was deemed to be in good working order after passing a one-hour, 3Uo VLF withstand test. 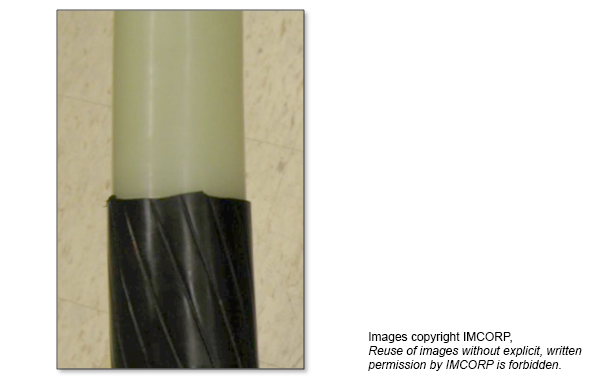 After that test, the IMCORP Factory Grade® assessment found this cable to be IEEE 48 noncompliant. Subsequent investigation found the PD site to be a non-radial cutback of the insulation shield. This substandard cutback features a very prominent jagged point—an extremely compromising feature because the majority of electric stress will be concentrated there, increasing the risk and likelihood of cable failure. This cable is a primary output from a power plant. The existence of an electric stress enhancement on one of the terminations is therefore particularly troublesome. Even more disconcerting is that the VLF withstand test passed such a compromised cable. The IMCORP Factory Grade® assessment was able to detect, locate, and assist in the remediation of this potentially destructive PD activity.